Located just SW of Chicago along highway 171, Cog Hill is easy to get to from any of the major freeways. Take 83 south to 171 and follow it to the clubhouse. The practice range is visible off the road and precedes the club entrance. Come early to practice and stay around afterwards for a drink or meal. This is a great environment for golf - and one that all levels of golfers can appreciate. Highly recommended. The spacious clubhouse features men's and women's locker rooms (the men's has 195 lockers, 6 private shower stalls and a shoe cleaning station) Dubs Pub Lounge (great atmosphere) and an expansive restaurant and patio serving breakfast, lunch and some dinners. Separate, fully stocked pro shops service courses 1 and 3 plus 2 and 4 and are furnished with the latest in golf clubs, shoes, attire and accessories. Cog Hill courses # 1, 2, and 3 are moderately priced layouts - and afford visitors an opportunity, as a guest, to experience all the Cog Hill amenities that the pros are accustomed to. 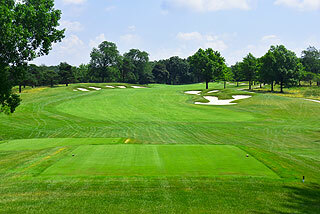 The practice facilities at Cog Hill include a secluded range and short game area for chipping and bunker practice. 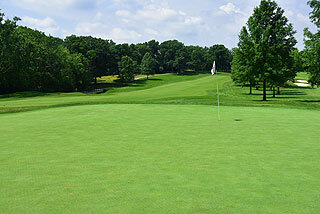 Expansive putting greens are located at three separate locations on property. Sensitive to the issue of the development of junior golfers, Cog Hill is developing a 3-hole layout and practice facility designed specifically for use by junior aged golfers. Staff and workers at Cog Hill are unpretentious - willing to assist the average person and provide nearly the same service that is afforded players on the tour. Top service is one of the prime reasons Cog Hill assures a good time to as many as 1200 golfers a day during prime season - as well as hosting a myriad of receptions, banquets, golf outings, meetings and special events. Over 400 people are employed at the Club during peak season! The success of Cog Hill as a major player in the golfing industry is largely related to the perseverance and dedication of its owner, Joe Jemsek - who began his career as a caddie and worker on the original courses here in almost every capacity - truly an original American success story! 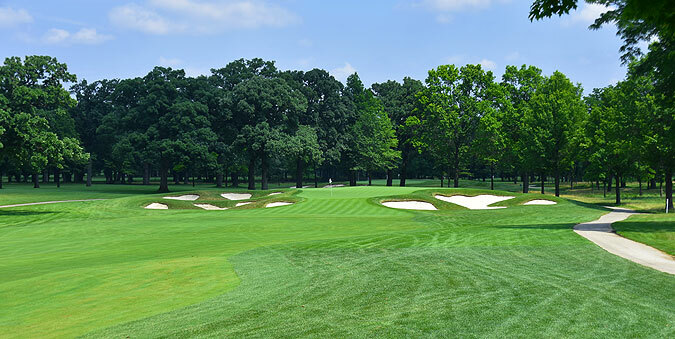 The Dubsdread Course at Cog Hill presents one of the most viable opportunities for the golfing public to play on a PGA Tour Championship course. 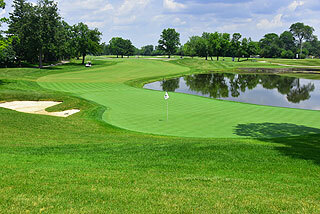 Dubsdread has played host to 9 Western Opens up to the year 2007, along with the 2007, 2009-2011 BMW Championship. The nickname "DUBSDREAD" is derived from the idea that a "dub" or poor golfer should beware and served as a warning of the challenges forthcoming. True to its name, this natural-style championship course places a high demand on shot-making ability by providing tight landing areas combined with heavily bunkered, large undulating greens. 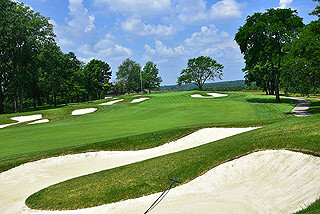 There are a total of 96 sand bunkers situated greenside and near landing zones and water comes into play on 3-holes. 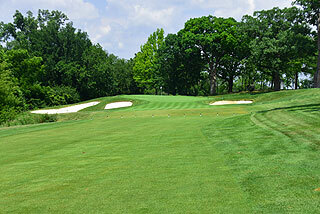 The Dubsdread course has 6 tees that provide an ample choice for all levels of players. The courses at Cog Hill are sufficiently marked with color coded stakes as yardage indicators - red for 100, white for 150 and blue for 200 yards away. Daily pin placement sheets provide hole locations, and the tee areas are marked with GAM's. Golf carts for #2 and #4 are equipped with GPS, providing distances to the hole, and hazards on course. 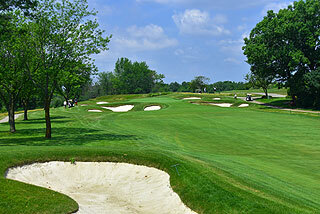 The yardages and slopes are: Forward tees- 5441 yards with a slope of 135 for women. Green tees- 6033 with a slope of 141 for women, 130 for men. White tees- 6382 yards, 145 women/134 men. Blue tees 6750 yards, 150 women/138 men. 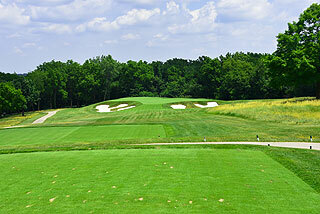 Gold Tees- 7144 yards, 144 slope. Black tees 7554 yards, 151 slope. 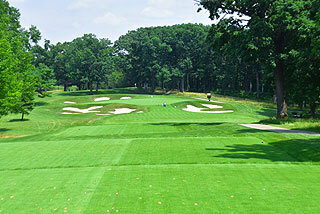 Hole #16 - 500 Greatest Golf Holes - Golf Magazine. Click here for the Two Guys Who Golf detailed information page containing a link to the Cog Hill Dubsdread Golf Club's website (if available).